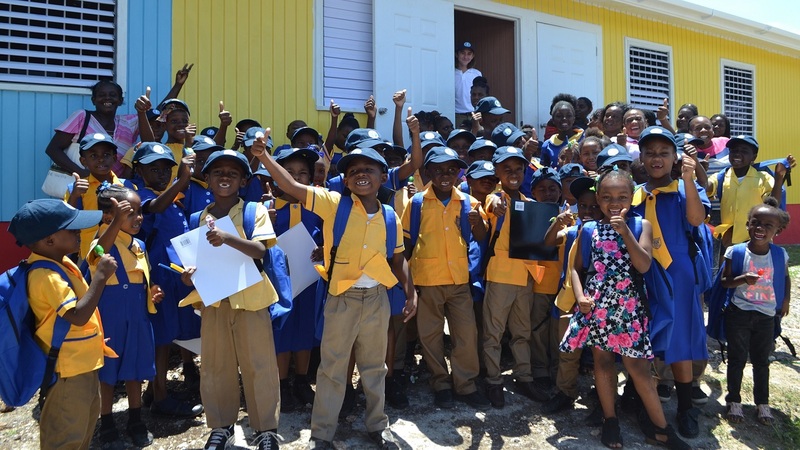 Rafe Cochran (by the door) shares in a group photo with students of the Runaway Bay All Age School moments after the ribbon cutting exercise for two new classroom blocks. 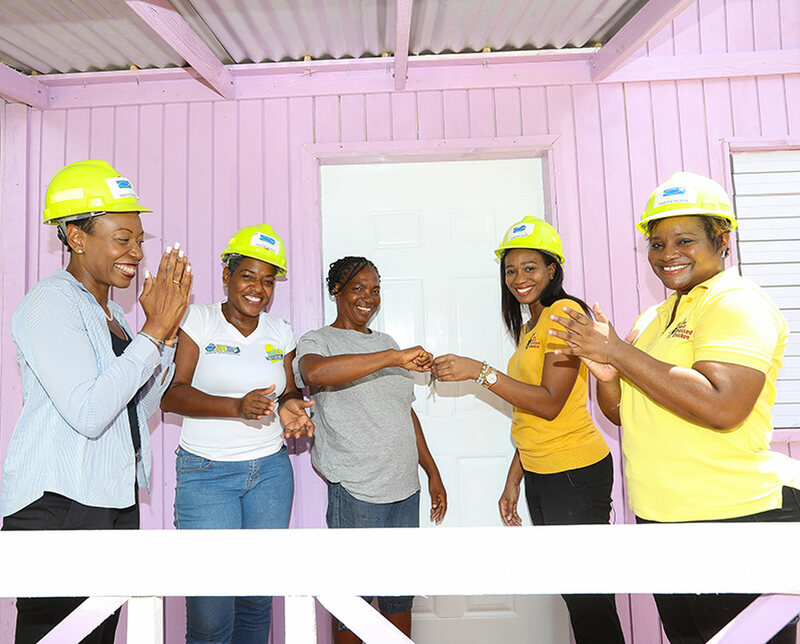 The Runaway Bay All-Age School in St Ann started the new school year with six new classrooms, an office for staff, and new bathrooms thanks to one of Food For The Poor’s (FFP) youngest donors, Rafe Cochran. Dozens of parents, teachers, students and community leaders gathered to meet and thank the young man from Palm Beach, Fla., who made their dream of a new school building a reality during the August 31 ceremony. 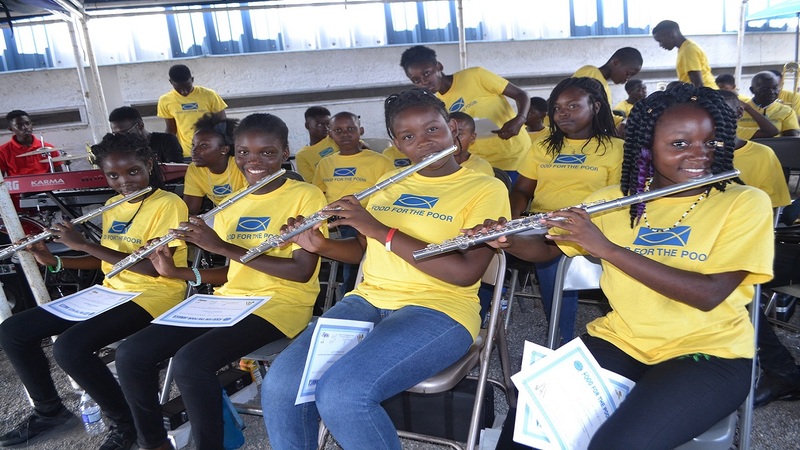 "To give the gift of a second school in Jamaica is an honour and truly feels rewarding," Rafe said. "The gift of education is so important to me because I feel education empowers one's life. I also feel proud to have the doors of the Runaway Bay All-Age School open. It is a wonderful feeling knowing I have been a part of enriching other children's lives." The 13-year-old golfer became one of FFP’s youngest donors at age nine. At age 11 he hosted his first golf tournament using his talents to raise money to build homes in Haiti and schools in Jamaica. With this year’s staging of the Third Annual Rafe Cochran Golf Classic, he was able to offer over 400 students at the Runaway Bay All-Age School a more secure environment in which to learn. "How many people can say that they have built 10 homes and two schools in two different countries by time they were 13 years old?" Food For The Poor President/CEO Robin Mahfood said. "Rafe's philanthropic efforts are astounding and Food For The Poor is deeply appreciative of his generosity. 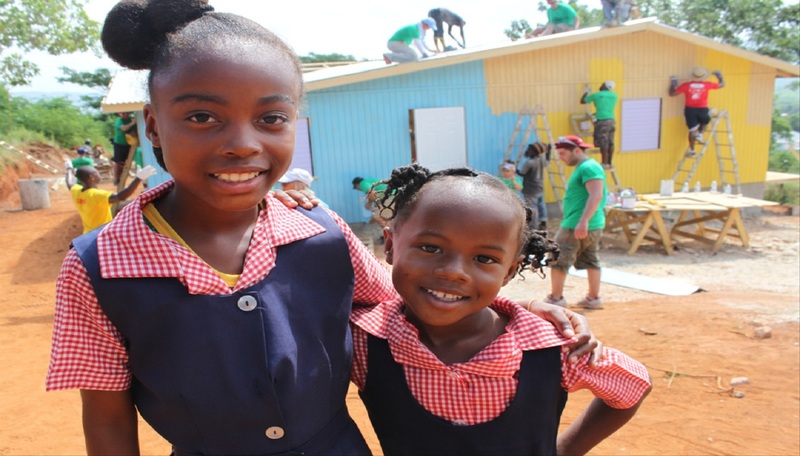 Ten Haitian families now have safe and secure homes, and schoolchildren for generations to come will benefit from the two schools in Jamaica. We also want to salute Rafe's parents for instilling these priceless values in their young son and for their support." The school's principal, Lambert Pearson, and staff also expressed tremendous gratitude to Rafe, his parents and to Food For The Poor for coming to their aid after they had waited more than a decade for a new school, which will accommodate kindergarten to sixth grade. The Cochrans helped to paint the exterior walls of Runaway Bay a cheery yellow, along with a calming blue and a bold red. While in Jamaica, Rafe and his parents, Jay and Diahann Cochran, visited the first school. The family was happy to see that Chester Primary and Infant School, also located in St. Ann, is well- maintained, the students are excelling, and that the school population has grown. "Rafe has impressed his whole family and shown us all the deep compassion he has for others," Jay Cochran said. "We believe that Rafe's ability to look beyond himself and to help the less fortunate will undoubtedly influence the younger generations. Rafe is a remarkable young man –we can't wait to see what he will accomplish in the future and the people he will touch with his generosity and compassion." "I gave each classroom in the new school a special name that really represents traits that one should aspire to have," Rafe said. "I chose the Room of Motivation, the Room of Integrity, the Room of Compassion, the Room of Kindness, the Room of Endurance, the Room of Confidence, and the Room of Respect. I feel each word gives a person character and to have good character means you have traits that make you honest and admirable." As Rafe embraces the start of the new school year, he's already entertaining the thought of future projects and the possibility of another school. "I will continue helping one person, one family, and one school at a time in order to make a difference," said Rafe. "I always say, you're never too young to take action and make a difference!"